Have you ever wanted to stroll around Kyoto in a kimono? I have always wanted to do so seeing many tourists walk in beautiful kimonos sightseeing around beautiful temples and shrines of Kyoto. I always thought to myself that I must do this at least once while I am in Japan. Kyoto is definitely the most famous place in Japan to do kimono fitting since it is an old capital with numerous wonderful old shrines and temples. A lot of Japanese traditional things that pop up in your mind when you think of ‘Japan’ or see in movies are here; for instance, Maiko, Geisha and other forms of arts, traditions, sweets and so many others. As you may know, I have done Maiko transformation before and it was such a great experience. You could never get closer to a Japanese traditional culture than this. 😉 This time, I wanted to simply wear a kimono and walk around Kyoto city, especially to visit Kiyomizudera temple (清水寺）and take photos for memories. I finally did it and I had a great time. It was worthwhile. As of how to do kimono rental （着物レンタル）in Kyoto, very easy! First, plan you trip to Kyoto. Leave a day or at least half a day in case you don’t have time for this experience since you obviously want to take a lot of photos while you’re wearing kimono. If you stay in a ryokan (旅館) within Kyoto, some kimono rental stores may allow you to return the kimono the next day at your hotel. But, in case you stay in a nearby city, you must return the kimono by the designated time at the store (until 5pm in my case). Keep this in mind when you plan your visit. Select store and decide the places you want to visit. For this, you want to choose a kimono rental store close to your hotel or tourist attractions that you want to visit. Especially when you’re wearing a kimono and walk around in kimono shoes, you want to be as close as you can to the places you are interested in. Yume Kyoto (夢京都）– I visited this store for kimono fitting. It is located right next to the entrance of Yasaka shrine (八坂神社）in Gion （祇園）district (central Kyoto) and only around 15 minutes on foot to the famous Kiyomizudera. Yume Kyoto also has another branch near Todaiji temple. They have kimono rental plans from 3,500 to 5,250 yen depending on the type of kimono. For 3,500 yen plan, you cannot choose kimono but for the 4,000 and 5,000 yen plan, you can choose kimono, bags and accessories as well. I liked their kimono choices. They also give free Tabi (kimono socks) for free and you can bring home as souvenirs. Okamoto （岡本）– This store is located in Kiyomizudera area which can be convenient for people who wants to visit this temple. I remember seeing in just on the bottom of Kiyomizudera! Yume Yakata 〔夢館）– The cheapest plan of this place is 2,500 yen which is pretty ideal. This is also the place I did my Maiko transformation. Make sure you reserve in advance so you can be sure you will get a place and time you want. 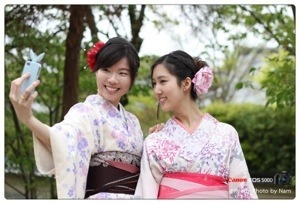 Usually, the price ranges from around 3,500 to 5,250 yen for Kimono rental. However, depends on the type and prints of kimono, it can also be much more expensive or less expensive if you are very lucky. At Yume Kyoto, I chose 5,250 yen kimono and got my hair done for 1,500 yen. So in total, it was 6,750 yen. Unlike Maiko transformation, you need to do your own makeup. After you are done dressing up, you are free to walk around in kimono and return it at the store or at your hotel depending on the store’s policy. Beware not to spill anything on your kimono. You may need to pay for the cleaning fee if you do so. Go to the store at your reserved time and tell your name. They will lead you into a room full of kimonos. Choose a kimono of your choice, then choose obi (similar to a big belt). 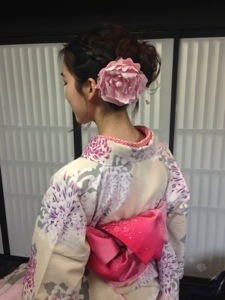 In my case that I chose 5,250 yen plan, I could choose a rope which is a layer inside the kimono, too. You can see my reddish collar inside my kimono which is not a regular white layer. Then, they will start dressing you up. Starting from the rope, inside layer, then kimono. After that, they will tie you with some more ropes and Obi. And then, you’re done! It took less than 30 minutes for me. After you’re done dressing up, they will lead you into a hair section where you can choose a hairstyle that fits you the most. The whole process took about 40 minutes for me. It is important to bring a friend to take photos for you. I was lucky as my friend’s friends join us with their professional cameras. So, we got very good photos. Also, prepare to smile a lot because so many people will ask to take pictures with you or try to snap a photo of you. Last but not least, CHECK THE WEATHER before you decide to do this. It is hard to predict the weather as you may want to reserve in advance but the day won’t be as fun if it’s raining, so try to avoid it! We met two tourists dressed up as Maiko-san, too. Big thanks to two amazing photographers Kenichi Sanguan-ngern & Nichchima Anongjanya. Luvniku, very well done! Great blog post for any interested women, tourists or expats living in Japan, you talk about the whole dressing in kimono experience. Thank you! 🙂 I’ve always wanted to do this once ever since I came to Japan. It was a great experience! Kimono rental doesn’t include make up since it’s not a special kind of make up like Maiko or geisha. Normally, for kimono rental in any place, you have to do your own make up. They only do hair. Thanks a lot for the blog! 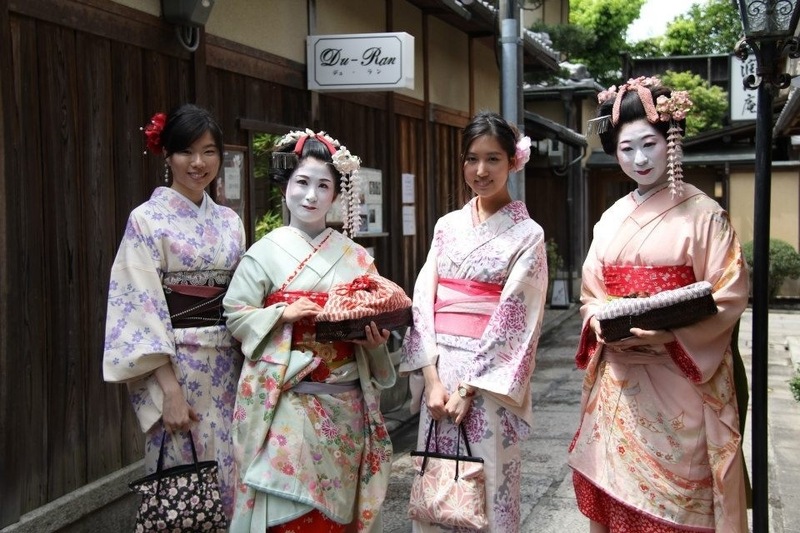 Don’t you know why kimono rental plan doesn’t include white face make up. My girlfriend wants very much to spend like maiko walking all day long but I found nothing like this in the internet. Maybe it is possible to make a make up first and then take a kimono rental plan? Please advice. I enjoyed reading your blog. Is there a specific kimono rental place that you prefer/recommend since you’ve been to both Yume Kyoto and Yume Yakata? Thank you very much. Personally, I like yume Kyoto. Easy access and they are quick. Very professional. I remember when I wore the Kimono for a day, and what a memorable day it was! 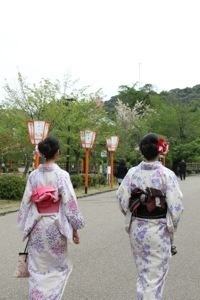 Excellent tips on kimono rental. I would surely do it when I’m in Kyoto this May.